So what is Awa Odori? And where does it come from? 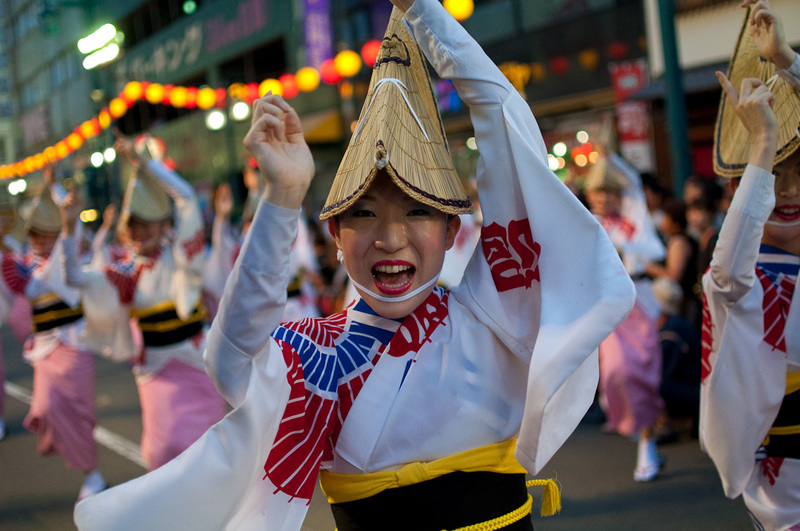 Well, as with other Japanese dancing, groups of choreographed dancers and musicians dance through the streets, usually accompanied by Shamisen, bells, flutes, and Taiko drums. 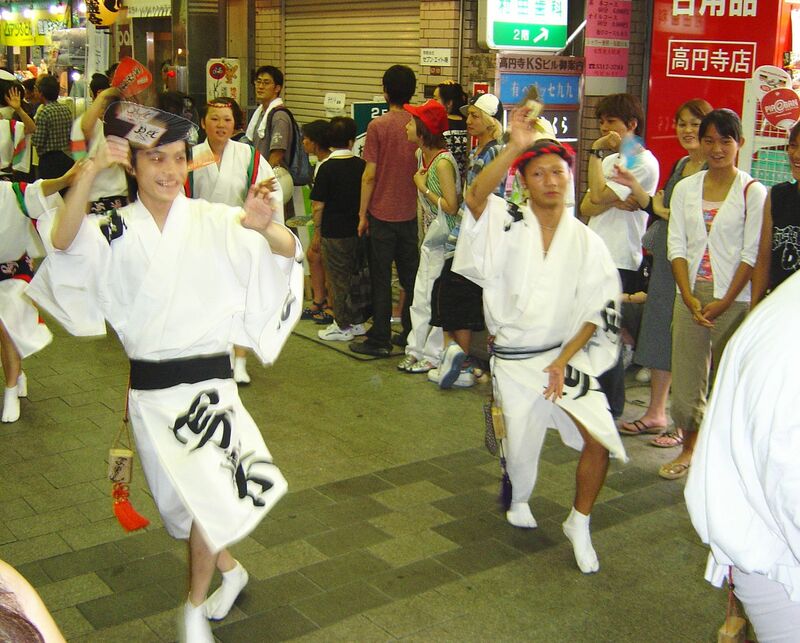 “Awa” (阿波) is the old feudal administration name for Tokushima prefecture, and odori (踊り) means dance. The earliest origins for Awa Odori is the dances that Buddhist priests performed during the Kamakura Period (1185-1333). However, the modern dance grew out of the traditional dance of Obon, the Buddhistic festival of the dead where it is believed that the spirits of deceased ancestors come to visit. 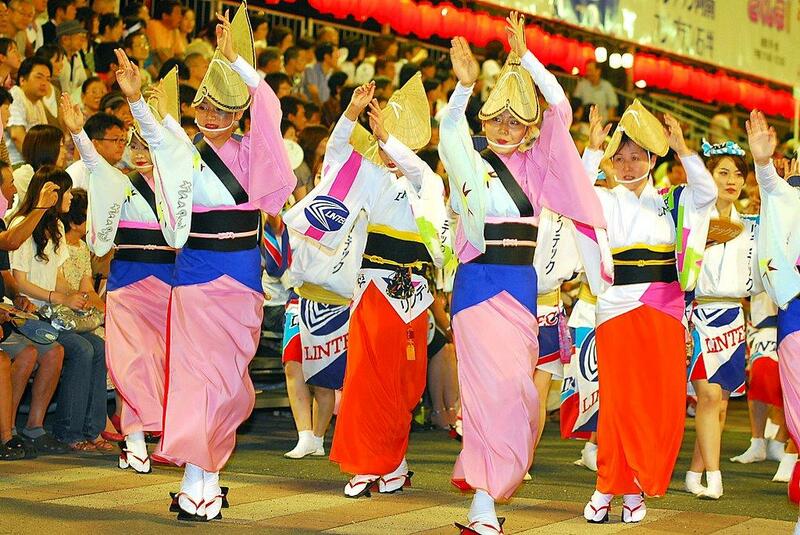 The term “Awa Odori” was first used in the 20th century, but even before that, the Obon celebrations in Tokushima was notorious for their size, exuberance, and anarchy since the end of the Sengoku Period (戦国時代). During the daytime a restrained dance called “Nagashi” (流し) is performed, but at night the dancers switch to a frenzied dance called “Zomeki” (騒き). Men and women dance in different styles. For the men’s dance: right foot and right arm forward, touch the ground with toes, then step with right foot crossing over left leg. This is then repeated with the left leg and arm. Whilst doing this, the hands draw triangles in the air with a flick of the wrists, starting at different points. Men dance in a low crouch with knees pointing outwards and arms held above the shoulders. The women’s dance uses the same basic steps, although the posture is quite different. The restrictive kimono allows only the smallest of steps forward but a crisp kick behind, and the hand gestures are more restrained and graceful, reaching up towards the sky. Women usually dance in tight formation, poised on the ends of their geta sandals. In May 2015, Japanese production company Tokyo Story will produce a substantially big version of Awa Odori in Paris by bringing there hundreds of dancers from Japan. “Awa Odori Paris 2015”, as the event is called, would reproduce the “fever” of Awa Odori. This event will be a first step to promote Awa Odori and the Japanese “matsuri” culture abroad. I don’t know about you guys, but I really want to get dancing right now! “Yattosa! Yattosa!” (^_^) Keep your eyes peeled for info about Awa Odori in Kouenji in our events page, or search for local events. See you in the crowd, perhaps! I saw and was amazed by the Awa Odori in Tokyo / Otsuka in 2012. Thank you for the detailed background info about the dance characteristics and its history!